Are you searching for ways and intends to make your windows pristine once more? Do you want to know how to skip chores like window cleaning without lifting a finger? You have picked the right company – the adepts of window cleaning in Crystal Palace will deal with this matter in the blink of an eye. Your windows along with their framework and ledges will look great, we guarantee that! You will no longer have to sacrifice your leisure time – the results of our activity will fully fulfil you. Our services merge top-notch quality with affordable price rates, so don't procrastinate – place an order now to save time, energy and money! We also provide our professional services in nearby areas: Thornton Heath, Norbury, West Norwood, Tulse Hill, Ashburton. You can depend on the cleaners for both domestic and business window cleaning. All types of glass surfaces are included in our professional routine. For instance, you can book a service for cleaning small or double windows, French doors, sash windows, bay windows and patio doors. In addition to these, we wash and polish garden window surfaces, greenhouses and skylights. At home or at the office, you can always have crystal clear glass surfaces – just phone us! We have the skills and the right methods for the task. Improve the look of your building – the specialists of commercial window cleaning will see to that. As part of our specific method, we use water-fed extension poles. With this approach, we can clean thoroughly the exterior of your office, up to the fourth floor. To reach higher windows we use rope access. We guarantee your windows will look perfect, regardless how high is the building. With the assistance of the squad of cleaners London's skyline will never be filthy. We use exceptional techniques of window cleaning to guarantee you will have superb end results. With the water fed pole cleaning system, high pressure cleaning and rope access equipment, you can be sure that your property's windows will be spotless. Furthermore, your house is in good hands – the cleaners are completely insured and carefully trained. Our water fed extension poles are attached to water supply vans, while our rope access guarantees safety – even when we clean high-rise buildings. You can get advantage from these techniques today – dial 020 3746 3113! 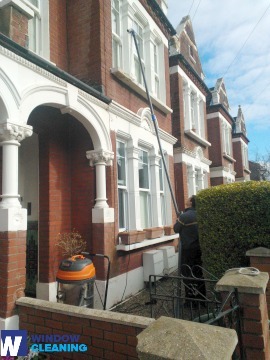 Benefit with our quick and dependable domestic window cleaning in Crystal Palace. We clean the windows of your home inside and out. The solutions we use are eco-friendly - you will love the perfect results and be ecologically responsible. Moreover, we use only purified water. Don't delay, call 020 3746 3113 and order our first-rate services. Our customer representatives will take care of you – they are accessible 24/7. We have other ways of booking – our request a cleaner online form or just chat with our customer care assistants.